Little did John and I expect to experience God’s saving grace and mercy so powerfully and so soon after enthroning the Divine Mercy Image in our home. It all started last Thursday, June 18. Having lunched at a popular chicken rice shop along Jalan Gasing, John, Michael (a dear friend) and I ventured (not planned beforehand) into a store, G to G Enterprise, dealing with Christian religious products. And, behold, hanging on its wall was the most beautiful image of the Divine Mercy that we’ve ever encountered so far. It was love at first sight! Nonetheless, we paid a deposit of RM400 and decided to collect it on July 6th when we’ll be around that area again for my mother-in-law’s post cataract-surgery appointment. Subsequently, I revised to collect it on June 30th and then brought forward again to Wednesday 24th. John was exasperated with my suggestion at the eleventh hour, just when we were leaving home to attend a wedding luncheon. Moreover, he wasn’t sure of the route and needed Michael’s help in mapping the way. Thank God that he put up with my fickleness though I couldn’t comprehend why my yearning to have home the Divine Mercy Image so soon. Must have been the Holy Spirit’s soft prompting, with something wonderful in store for us! We brought home the lovely Mercy Image that Wednesday afternoon, a little disappointed though that no priests were available at the Church of St. Francis of Assisi to bless the Image. Again, why the urgency? Only when everything finally climaxed into an extraordinary miracle the next day (that was yesterday) that made us realized God’s loving hand in everything that had happened. Yesterday was a day filled with alarm, fear and terror, yet wonder, awe and amazement surfaced as fast as the negative feelings waned as we ponder on the miraculous event of that day. John and I started the morning by going to Church at about 10 am to have the Image of Divine Mercy blessed by our beloved Assistant Parish Priest, Fr. Andrew Manickam. Then, into the Church to pray, praise and thank God for all His unceasing love, mercy and blessings. Returned home about half an hour later and then out again to accompany my mother-in-law for her monthly medical appointment, have lunch, shopped for groceries at Tesco and sent her home. My beloved and I then proceeded to run some errands and returned home almost 3 pm, only to be paralyzed momentarily with fear as we noticed 3 guys inside our house compound, just outside our sliding glass door. Frightfully alarmed and glued to our car seat, so to speak, it took us a few seconds to realize they were burglars, trying to break in. Upon seeing our car parked outside the entrance gate and realizing that the house-owners have returned, they coolly walked past our car with a threatening look as they passed by before entering into a white Kanchil car parked across the road! Only then, dare we jump out of the car and managed to see the car number which we included in our police report later. Praise the Lord Jesus that we returned in the nick of time to thwart the plans of the robbers. Such precise timing! Had we been a minute or two later, they would have broken our sliding glass door and gone inside and heaven alone knows what disastrous consequences would have unfurled. Instead, only the padlocks and grille were damaged as seen in the photos above and by the grace of our Merciful Jesus, both of us were safe and unharmed, and home not broken into. We’re extremely overwhelmed and in awe of God’s wondrous power! As we ponder further, we know undoubtedly, with confidence and trust that God had manifested His love, protection and mercy through the Divine Mercy Image that grace our home since the day before. 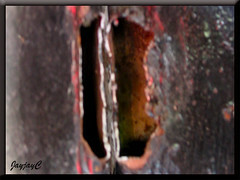 That unexpected brush with the burglars who didn’t harm us at all, occurred just before 3.00 pm, the hour of great mercy. God shielded us for sure. What an amazing experience of His tender loving mercy! A marvelous miracle indeed. More about the Divine Mercy Image here and here. Do explore the websites whose links were given above for more divine revelation from Jesus to St. Faustina. We praise and thank The Lord Jesus for everything. Boundless are His blessings, love and mercies, and ever faithful in His promises to all people. All praise, glory and honor to you always, O God! Jesus saves! Tell the nations! Tell it to your friends everywhere! And declare that Jesus really saves! And let Him shine through you! Thanks for sharing your wonderful story. By God’s grace both you and John were spared the misery of a break-in not to mention what they would have done to you both! Let’s have the next BEC meeting at your house so that all of us can experience The Divine Mercy. God Bless. Praise the Lord! I agree with you that Our Lord have given you victory over the enemy. In May 2009 my husband and I was having a fantastic holiday in Turkey. 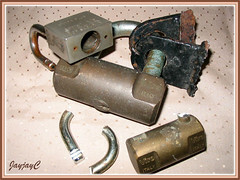 On the 7th day of the tour the locks on 2 of our bags which was left at a tour agent’s office was broken. But the good news is by the grace of Our Lord Jesus the money in both our bags were not taken. Thank God I was given victory over the enemy. Let us pray that sin everywhere be brought under the power of the Cross. In Jesus name we pray. Amen. Thank you for sharing your experience, Lucy! Indeed, God works in such marvelous ways, and most times least expected! even i and my family has experienced many miracles of the divine mercy!!!! 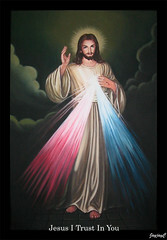 divine mercy i trust in thee!! Our pleasure, Sona! Trusting in Jesus, may we continue to experience His never-ending grace and mercy in our lives. Praise God! “Jesus I Trust in You”. Oh Blood and Water, which gushed forth from the Heart of Jesus as a fount of mercy for us, I trust in You. (Three times). This is the prayer that taps into the Ocean of God’s Mercy. I saved my dearest grandson from drowning through the Divine Mercy at the hour of of Divine Mercy. Believe it or not. Spread this Devotion to everyone so they can benefit from this great gift of God.